It's day 3 of Whimsy Stamps April release showcase and another day for you all to have a chance at winning one of Whimsy's brand new stamps. To be entered into today's mini blog hop prize draw, all you have to do is leave a comment on ALL of the DT's posts listed below by 12.00PM EST tomorrow. All winners will be announced on the Whimsy blog on 25 April. Here is what I made for today. I used the super adorable stamp "Goldie" from Whimsy's Wee Stamps collection. She has been colored using Faber Castell Polychromos Pencils. The Designer Papers are from the 6x6 pack Hello Luscious by Basic Grey. I embellished with some white Whimsy Buds which I sponged using island indigo ink (SU), some flourishes made with Whimsy's Vines shapeology die, then added some ribbon and glitter too. I purchased the little flowers from Whimsy Stamps, they came in cream, I just inked the edges with some island indigo ink. The sentiment is from the new Ticket Notes Sentiment from this month Whimsy release and I cut it out using the ticket shapeology die. To finish it off I sewed around the edges. Thanks for stopping by and don't forget to pop back to the Whimsy blog tomorrow for more new release creations! So so cute! Love the colors you have put on her; just super adorable! That pink hair is rocking! Oh and those long tickets are FAB! Hi I saw this sweeet stamp on day 1 and I have to say she is my favourite (mind you I really like mermaids!). You have made her into such a lovely card, great work! I love this Mermaid!! I went and bought her on the 1st day out!! Had to have her as a stamp. I already have her as a digi!!! Your card is very Adorable!!!! So so so pretty! Live the pink hair! Great Job! Pink mermaid hair, love it! she's so pretty. Love your color choice! 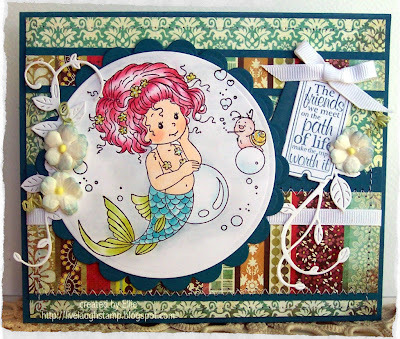 Your card is beautiful and I'm loving all of the layering you've done!! Love the pink hair! Very pretty papers! Your card is beautiful! Love the colorful papers and the image is so sweet! Your card is so cute. I love the papers and the image is so lovely. This image is so great. Its my favorite this release. Great card. And the sentiment stamp is also super. This is adorable, Ellie! I love the papers and the darling image! Fantastic coloring! Oh so cute!! Great colours and embellies too!! This Goldie stamp is my favorite in the new release! Love the colors! Oh I absolute love Goldie. And what a great job you did with the hair! stunning! Fabolous card Ellie,love the colours and embellies! Oh she's just adorable, love this Ellie! A beautiful card. Love the image and great papers and colours used. Beautiful red hair did you give her! Very nice card. my gosh, everything about this card just makes me smile. :) love all of the little touches you've added. What a beautiful card and that image is Sooooo Sweet. Thanks for the inspiration. Such a darling card! Love it. Goldie is adorable--great coloring and papers. Cutest little mermaid I ever seen. I love the card you made with this delightful stamp Ellie. OMG - I love this image! Your design and elements are amazing! Great card! Beautiful! Love the papers and the embellishments! Such a sweetie. Gorgeous expression on her face and you find yourself smiling when you look at her. Your card is stunning. Oh! I just love this image..I like the way you have coloured her..beautiful red hair..gorgeous papers too! Love the sentiment it does go with the image brilliantly! the paper used on all your creations is beautiful, the colors compliment each other perfectly! I have a soft spot for mermaids, this card is adorable! Wow this is the cutest little mermaid I ever saw!!!! Fancied to perfection!! like the look with these Faber Castell pencils!!! Such a beautiful card! Love the flowers and sentiment! I am so lovin' this little mermaid. Your card turned out great. This little mermaid is super sweet and you've done a great job incorporating her into your card! oh Wow, Ellie, this is gorgeous hun! I love your coloring, always, and the papers you used here. a really great design! Goldie the mermaid is so cute! Love those little vines, too. Like your colorful card. oh how cute is she? I just love Wee Stamps! Wowwww, waht a sweetie. The stamp is so lovely. Elli, this is so adorable! I love her pink hair! Fabulous colouring and a great design.